A quick post on what I'm wearing on my nails today. I did a chevron print inspired nail but it didn't turn out the way I envisioned. Using glitter as the accent wasn't the best idea -- at least the way I applied it. It looks great over the solid polish, but under it is another story. It looks clumpy and messy. In hindsight, I should have kept the glitter on the top. 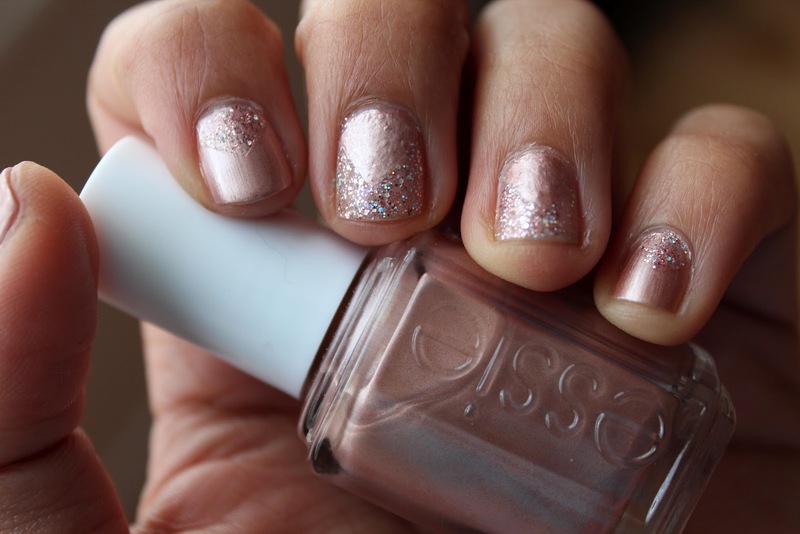 At any rate, Essie Buy Me a Cameo is a great polish and I would give it ♥♥♥♥♥. It's a beautiful pearly champagne colour. A little streaky to apply because of the pearl-like finish, but it's lovely on the nail. A slow and steady application will give you the perfect finish. Thinner coats won't hurt either. ps, the glitter I used is Strobe Lights from Sally Hansen Xtreme Wear :).